“Some babies get their first tooth at 3 months, some at 4, and some don't get that first tooth until around 14 or 15 months,” says pediatric dentist, Dr. Michelle Kelman. Symptoms of teeth normally start about three to five days before the tooth shows and will cease as soon as the tooth breaks through, although some babies are not agitated by teething. Common signs of teething are swollen or red gums, mood changes or irritability, fussiness, excessive biting or chewing, excessive crying, sleeplessness, refusing to eat or drink, pulling on ears, and mild fever. Drooling or attempting to chew on objects are another key signal of the onset of teething. Some report teething causes runny noses or low fevers. the tooth comes through the gum. For some, symptoms might last through the night, while other children will not experience severe teething symptoms at all. Which baby teeth come in first? Your baby’s teeth typically appear in a certain order. Lower central incisors come in first, followed by later incisors, first molars, canines, and second molars. Many of the best tips for soothing teething pain are natural remedies. There are a wide range of chewable toys on the market for your baby to gnaw on while their teeth come in. Throwing a teething ring in the freezer for a few hours will feel extra comforting on their sore gums. However, some of the best teething devices can be made from household items. “There are thousands of teething toys out there on the market, but the truth is; a cold wash cloth works really great for soothing those sore gums,” suggests mom and COO of Illumination Entertainment, Natalie Fischer. Some parents turn to gum soothing gels for pain relief. “You can also use topical gels that you would put on your child’s gums. And another way that you can help is by using homeopathic capsule or a teething tablet. And I found, in particular, that my child really benefited from that,” says mom and writer, Jessica Jones. Homeopathic capsules, as shared by Jessica Jones, also contain chamomile, which can help soothe that fussiness or irritability that comes from the pain. “You can ask your pediatrician about using Tylenol or Orajel for the really acute pain, but I also find that cold, pureed baby food is great for an infant that's already transitioned to solids. The most important thing to remember, is that the acute pain only lasts for a few days. This too, will pass,” says Natalie Fischer. As your baby gets older, generally over the age of six months old, it can also be beneficial to add frozen fruit or breadsticks into their diet. As always, make sure they are able to chew and swallow properly, to minimize any choking risks. Before administering any treatment for teething, it is important to see a pediatrician. Some medications may have effects on young teeth. “For example, many cough syrups and medications do contain sugar,” Dr. Michelle Kelman explains, “Chronic use of these medications, may affect the teeth. If you can, I would always request a sugar free solution. If that's not a possibility, I would make sure to always rinse the child's mouth with water following giving them medication; or if possible, to brush their teeth immediately. Gina Gonzalez, DDS and denstist also suggests that baby and primary teeth are flossed to minimize the amount of decay and bacteria present in your baby’s mouth. As new teeth grow in, it is important to make sure they stay clean and healthy. Since there are multiple methods for combating teething issues, trying different solutions can lead to finding the most effective method. Some babies just need a little extra attention and love, which can really go a long way, as mentioned by Jessica Jones, a new mom herself. Just be sure to look out for changes in your baby or any important signs. What Parents Need to Know Mouth development begins in utero and progresses very quickly in the first six-months of life. 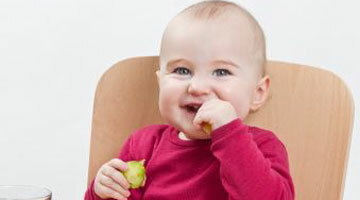 When a baby begins teething it can be a very distressing time for you and your baby.